He was an odd-duck Vermont farmer who invented photomicrographythe use of photography to capture images in a microscopeand produced thousands of stunning photographs of snow crystals to prove that no two are alike. Hexagonal plate photographed in 1896. An idiosyncratic, self-taught meteorologist and photographer, Bentley was America's first cloud physicist. 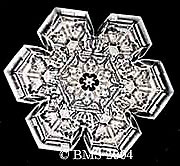 He made 10,000 glass photomicrographic plates between 1880 and 1926, upon which he captured the images of 5,000 individual snow crystals and 5,000 images of dew and frost. This collection has been held since the 1930s by the Buffalo Museum of Science, although its fragility has prevented its widespread use by researchers or the public. Over the years, the glass plates deteriorated, however, and the work of Wilson Alwyn Bentley might have been lost forever to researchers and the public had not a group of UB graduate students stepped in to save it for posterity. Ordinary dendritic crystal photographed in 1901. Bentley's images now are available to the public, thanks to students in the School of Informatics, who have developed a fully operational digital library for the Wilson A. Bentley Snow Crystal Collection http://informatics.buffalo.edu/faculty/abbas/bms/. The work was accomplished in a graduate course in collection development taught by June Abbas, assistant professor of information and library studies. Although it is online, the library should be distinguished from a Web site, Abbas says, because it is a much more complex structure, requiring a huge amount of work and developed according to strict rules of information science. Hexagonal plate photographed in 1902. "It looks like a Web site on the surface, and it is accessed through the Internet, but when a user performs a search in the library, it searches only the library site, not the entire Web. Access to the collection is unrestricted, however, and anyone can use it," Abbas says. Just as with development of a collection in a brick-and-mortar library, the students first devised a collection development policy to determine what would be included and excluded from the collection, she adds, noting that many slides were not used for a variety of reasons. "Copyright policies were developed, reproduction methods established and employed, historical material about Bentley, his processes and his relationship with the scientific community of the day were developed for inclusion in the library," Abbas explains. The collection is divided into primary and secondary groupings. The primary collection is the more extensive and comprehensive, offering a 154-piece, high-quality, unretouched sample of the 5,000-piece analog, or glass slide, snow-crystal collection housed at the Buffalo Museum of Science. It also includes dynamic information resources to further appreciation and understanding of Bentley, his methodologies and the collection. The students classified, arranged and distributed the slides according to the snowflake classification scheme of C. Magono and C.W. Lee, first published in the article "Meteorological Classification of Natural Snow Crystals," Journal of the Faculty of Science, Hokkaido University, 1966. The Magono and Lee classification scheme, says Abbas, provides for a numbering and lettering system that categorizes snow crystals according to their general shape and structure. There also is a link to the Jericho Historical Society Web; Bentley worked and lived in Jericho, Vermont. The society sells framed reproductions of several microphotographs from the collection, with royalties going to the Buffalo Museum of Science. The secondary collection of images provides a sample of the breadth and range of Bentley's work and of its declining physical condition today, according to Abbas. 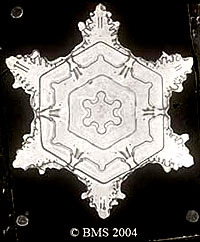 It illustrates some of the problems faced by those trying to preserve the deteriorating glass plates, many of which have peeled, lifted and flaked, resulting in the loss of portions of the snowflake image, problems common to such a fragile glass plate collection. The secondary collection also contains pages transcribed from Bentley's journals. 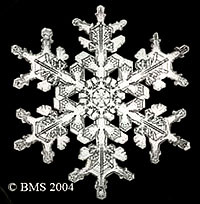 An illustration of the aesthetic differences between a positive and a negative snowflake image also is included in the secondary collection, as well as examples of degrading slides and composite images, or collages, created by Bentley. The UB graduate students who developed the digital library worked in seven teams, says Abbas. The user liaison team, for example, worked with museum representatives, handled scheduling, collected necessary information on the collection and determined who users likely would befifth through 12th graders and their teachers, meteorologists and, because of the beauty of the collection, photographers and artists. Another team worked on collection development. It established slide-selection criteria and trained other students to choose among the 5,000 slides using those criteria. This team also located and examined each slide to see if it was clear enough, in good condition or a duplicate. The copyright team was responsible for development of copyright-use and compliance policy. The digitization team worked with Abbas to determine how best to digitize the images and scheduled the students at the museum for this purpose; developed specifications for how images would be saved, and edited files for resizing. They are saved in different dpi ranges for different purposes. "We went through a testing phase to learn if anyone had worked with this kind of collection of photomicrographs, glass slides or lantern slides so they could tell us how they reproduced the work," Abbas says. "Most had outsourced such work to companies like Kodak, however, which wouldn't share their processes with us. "We tried using a digital camera, but quickly determined that the best reproduction method would be to use a high-end digital scanner," she says, "so the team developed the process using an Epson Perfection 4870 scanner. They were scanned at a 600 dpi resolution and that image saved to tif files. The high-resolution images were the archive images kept by museum. Images with lower dpi resolution were developed from the archival images for various purposes." Another team compiled the bibliography for the site, wrote the pages that described Bentley and the photographic processes used, and searched catalogues and the Web to come up with the best material they could find. "That is what librarians do," Abbas points out, "and that is what the course trained these students to do. Along the way, they became quite interested in him as a figure of history and science." "Bentley was a brilliant and idiosyncratic individual, gifted with a remarkable determination and vision," she says. "His curiosity and drive led himat the age of 19, mind youto develop a whole new photographic field. He developed into a pioneering scientist and photographer passionately dedicated to capturing and sharing nature's beauty, mystery and magnificent design, particularly as they were manifested in snow crystals." Although in 1920 he was elected a fellow of the American Meteorological Society, Bentley's work largely was ignored by the scientific community during his lifetime. After his death in 1933, however, he achieved a reputation as a pioneering weather scientist and photographer. He lived to see the publication in 1931 of "Snow Crystals," a book of his images, but died of pneumonia that year after walking home in a blizzard.